Laughlin, Nevada has 10 area golf courses. Most Laughlin, NV casinos offer special deals to include golf. Emerald River Golf Course: An 18-hole, par 72 course, its features include a driving range, putting green, rental carts, club rental and professional golf lessons. This is a contoured course with very narrow fairways. Take a "desert club" for off the fairway shots! 1155 S. Casino Drive, Laughlin. 702-298-0061. Chaparral Country Club: Open to the public, this is a nine-hole executive course, par 32, and features a pro shop, practice green, snack bar and golf car rentals. It is 7 miles south of Bullhead City off Highway 95. 1260 E. Mohave Drive. 928-758-6330. 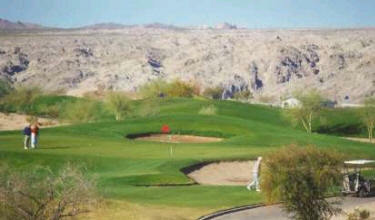 Desert Lakes Golf Course: Desert Lakes is an 18-hole, par 72 course. Features include a driving range, putting green, rental carts, pro shop, snack bar and professional golf lessons. It is south of the Bullhead City limits approximately 4 miles and is east on Joy Lane from Highway 95. 928-768-1000. Riverview Resort and Golf Club: Sand traps, lakes and rolling greens make this a challenging nine-hole, par 3 golf course. The Club offers pull carts, electric riding cars and clubs, a pro shop, soft drinks and food. This is the closest golf course to the Laughlin casinos. 2000 E. Ramar Road. Call for tee times. 928-763-1818. Valle Vista Country Club: This is an 18-hole course located 17 miles east of Kingman on Historic Route 66. Turn left at milepost marker 71 (Concho Drive) 9686 Concho Drive. 928-757-8744. Cerbat Cliffs: 18-hole course meticulously maintained. Tough, tight fairways and sculpted tees. Set beneath the rough hewn terra cotta plateaus of northwestern Arizona. Fully enclosed driving range, chipping and putting greens. Take Interstate 40 to Falcon Hill exit (second exit past Kingman). Go left on Falcon Hill a half mile to course. Needles Municipal Golf Course: This is an 18-hole, par 70 course with very reasonable green fees, a lighted driving range, lounge, rental carts, snack shop, pro shop and professional golf lessons. 144 Marina Dr., Needles. 619-326-3931. Willow Spring Golf Course: This nine-hole, par 3 course, is a walking course which offers pull carts and club rentals. It has natural grass turf and a driving range. The course is 12 miles south of the Bullhead City limits on Highway 95. 8011 Highway 95, Mohave Valley. 928-768-4414. Laughlin Ranch Golf Club: One of the Southwest's newest entries on the golf scene, Laughlin Ranch Golf Club, promises to be a layout to remember. Playing 7,297 from the tips, the Dave Druzisky 18-hole design located in Bullhead City, Ariz., will be all the golf test players can handle. Three par 5's play more than 600 yards including the finale, a 625-yard challenge that promises to be a knee-knocker. 1360 William Hardy Dr. Bullhead City, AZ 86429 (702) 535-4653 or 1-866-684-GOLF. Off the Bullhead Parkway, go straight across the bridge from Laughlin or ask your hotel desk for directions. Golf Lesson: 2, 3 and 5 day golf instruction vacations at over 50 locations across the United States.